Inspired by James Cameron’s Avatar film, Cirque du Soleil brings us TORUK – The First Flight, alive multimedia immersive spectacle. Narrated by a “Na’vi Storyteller” and populated by various other characters, TORUK – The First Flight is a tale set thousands of years before the events depicted in the film Avatar, and before any humans ever set foot on Pandora. When a natural catastrophe threatens to destroy the sacred Tree of Souls, Ralu and Entu, TORUK… two Omaticaya boys on the brink of adulthood, decide to take matters into their own hands. Upon learning that Toruk can help them save the Tree of Souls, they set out, together with a newfound friend Tsyal, on a journey up in the Floating Mountains to find the red and orange predator that rules the Pandoran sky. Prophecy is fulfilled when a pure soul rises among the clans to ride Toruk for the first time and save the Na’vi from a terrible fate. 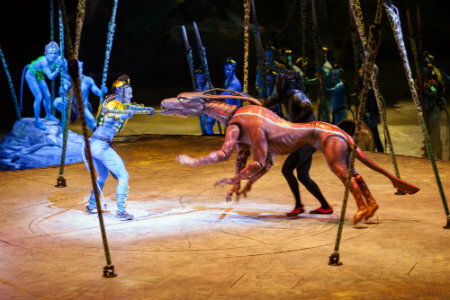 Unlike other Cirque shows renowned for their acrobatic performances, TORUK… incorporates cutting-edge visuals, puppetry, some acrobatics, all accompanied by an interesting score. The story, at best, is superficial and ‘fluff’, which will please mainstream audiences. There is no real depth to the characters, but perhaps this is not the goal in this show. TORUK… portrays the characters as happily going along in their journey without any trepidations; somehow things will work themselves out. This show is aimed to visually please audience members of all ages. The show’s merits lie in the use of great visuals, lighting, and puppetry. Multimedia stage directors Michel Lemieux and Victor Pilon create a world within an arena that is both beautiful and precarious at the same time. Set changes occur within seconds by converting the set into a giant screen, where video projections take us through the various terrains in Pandora. It is quite impressive. The lighting is just as important in the show, as it helps to move us through the emotions of the main characters, as well as, through the journey they have embarked on. Visually, this is where TORUK… captured my attention. I found myself in awe at the speed and accuracy with which the set changes happened. Along with the lighting effects and music, each set fills in the gaps in story by taking us along with Ralu, Entu, and Tsyal on this journey of discovery and adventure. Timing is impeccable when it comes to multimedia projections and lighting. The puppets are also impressive. Puppet designer, Patrick Martel adds a myriad of animal characters to TORUK... that make it more appealing and impressive to all audience members. There are 16 puppets which represent the creatures of Pandora: six Viperwolves, three Direhorses, three Austrapedes, one Turtapede, two swarms of Woodsprites, and one Toruk. The puppeteers all wear microphones and create their own sounds for synchronization with their movements. The Toruk, or Great Leonopteryx, is definitely impressive once it comes to live – or flight – but so are the viperwolves, seen below. Missing some of the impressive acrobatics Cirque is known for, what it lacks in performance, it makes up for in its visual concepts. A definite visual treat. As a show inspired by the film, TORUK... will provide entertainment for the whole family.TORUK – The First Flight continues at the Air Canada Centre until January 10th. For tickets and box office information, go to www.cirquedusoleil.com.